1 Burning Question: Can Tom Herman Lead the Cougars to an AAC Title? The Houston Cougars have had pretty good luck over the last decade when it comes to selecting new coaches to take over their program. First, it was current Baylor head coach Art Briles, who led the Cougars to four bowl games from 2003-2007, erasing an era in Houston football in which fans expected five wins or fewer each year. When Kevin Sumlin took over in 2008, winning was taken to the next level. After leading the Cougars to an 11-1 record in 2011, it looked like the Houston football program had ascended to the next level. Even with Sumlin moving on to Texas A&M, new head coach Tony Levine was able to lead his new squad to a win over Penn State in the Ticket City Bowl. After two mediocre seasons, it looked like Levine had things figured out with 14 returning starters heading into the 2014 season. The Cougars left a lasting impression in week one, but not the right one: a burnt watermark against UTSA in the brand new $128 million TDECU Stadium, in which the Cougars got blown out, 27-7. Even though they finished 8-5, from there it became clear that the University of Houston administration would go in a different direction in the offseason. Now, former Ohio State offensive coordinator Tom Herman begins his first journey into the head coaching realm, with 11 returning starters and a ton of talent all over the field. 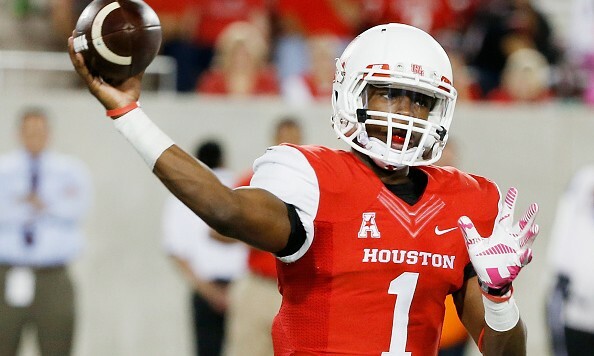 Dual-threat quarterback Greg Ward returns as one of the most efficient passers in the nation. The wide receiver turned starting signal caller completed 67% of his passes last season while throwing for 2,010 yards and averaging nearly 5 yards per carry on the ground. Senior tailback Kenneth Farrow returns to the backfield after becoming the first Cougar rusher to total 1,000 yards since 2008. AAC Special Teams Player of the Year DeMarcus Ayers will attempt to make his mark at receiver. As a number two option last season, the junior averaged over 10 yards per catch. Herman, who has been labeled an offensive mastermind, will have a lot of weapons to work with alongside offensive coordinator Major Applewhite. On defense, Houston returns three of its top six tacklers from a year ago. After two years of holding opposing offenses under 150 rushing yards per game, the Cougar defensive line is in rebuilding mode — losing five of its top six tacklers. Five-star recruit Edward Oliver will play a huge part of the rebuild, starting in 2016. Until then, defensive coordinator Todd Orlando will have some work to do up front. Orlando has plenty of experience as a defensive coordinator (since 2008), and he’ll be working alongside co-coordinator Craig Navier, who has served as either a special teams or defensive coordinator over the last 17 seasons. Both will lean on what is arguably the best secondary in The American, led by an all-senior core of Lee Hightower, William Jackson, Adrian McDonald, and Trevon Stewart. The American Athletic Conference might be one of the most underrated in the country, and the Cougars will have some tough contests throughout the year. Things set up nicely, though, for first-year head coach Tom Herman and his squad. Two of their toughest contests come late in the year, both at home. 246 — The number of rushing yards the UH offense averaged in winning contests last season. It’s hard to believe that under Tom Herman, those numbers won’t go up, especially with Kenneth Farrow and Greg Ward in the backfield. What needs to change is the inability to rush in games that ended up in losses. The Cougs averaged 86 rushing yards per game in contests they lost last year. 54 — This is the percentage of red zone drives that ended in touchdowns. With playmakers like Greg Ward at quarterback, alongside running backs Kenneth Farrow and Ryan Jackson, this has to improve. It will do so with the creativity of Tom Herman and Major Applewhite. Why it matters: The Cougars will face three highly ranked conference opponents during a four-week span late in the season. It starts in Orlando, where Houston will have a good chance to win as George O’Leary replaces his top four receivers and defensive backs. The Golden Knights will still be a true test, however. They have gone an unbelievable 22-2 in league play over the last three years. Herman understands the UCF playbook, though. He defeated the Golden Knights in 2012 as Ohio State’s offensive coordinator. A win could propel Houston heading into its home games with Memphis and Cincinnati. The good thing is Herman is familiar with the Bearcat passing attack, facing Kiel and company last season with the Buckeyes. Why it matters: The Bearcats are the heavy favorite to win the East. Gunner Kiel returns to Cincinnati as one of the best quarterbacks in the country, but someone with a lot to prove. Tommy Tuberville is the type of coach that Tom Herman wants to live up to. A win over the East favorite would give Herman’s team major confidence heading into the biggest clash of the year a week later against the Memphis Tigers. Why it matters: Getting to a conference championship game in the first year of the Tom Herman era could all depend on whether his team can defeat the Memphis Tigers for the sixth straight time. Head coach Justin Fuente returns to the Tiger program, despite the very real possibility that he could have moved to a higher level of competition in the offseason. The Tigers will look to avenge a loss to UH last season, one which stopped them from securing an outright conference title. If Houston can’t get past a defense that gave up just 15 points per game in AAC play last season, they more than likely won’t be headed to the first ever American Athletic Conference Championship Game. Kenneth Farrow, RB – The senior had a great junior campaign and returns to the Cougars in an even better offensive system, as Phil Steele’s top running back in the AAC. It’s not crazy to think that Farrow could rush for over 1,200 yards and average better than 6 yards per carry as a senior. Greg Ward, QB – The biggest key to Tom Herman’s offense is having a quarterback that can make quick decisions, create plays on the run, and be accurate with the football. Ward is one of the more accurate quarterbacks in the country when given a chance to throw. No matter what, he is one of the most dynamic in the country. Having a Braxton Miller-like playmaker on the field will be vital for the Cougars this season. If Ward can throw for over 3,000 yards and rush for 800 or more, the Cougars will be in a good position to win the conference title. B.J. Singleton, DE – The only returning starter from the defensive line needs to have a big season, especially since Todd Orlando has made the switch to the 3-4 defense. Singleton had 3 sacks last season; at 6’4” and 290 pounds, the junior is very athletic. It wouldn’t be surprising to see him play all three places up front for the Cougs this season. Adrian McDonald, SS – The leader of the secondary is a do it all defensive back that will be relied upon for both run and pass defense. The leader of the “JackBoyz” picked off five passes last season, had 75 tackles, and forced three fumbles. McDonald is the driving force behind the turnover-creating machine that is the Houston secondary. 5. The Houston rushing attack will finish in the top 10. The Cougars averaged over 183 rushing yards last season, which was 44th in the nation. What Tom Herman brings to the table is consistency on offense. Houston will not average 86 yards on the ground in losses this upcoming year. The combination of Kenneth Farrow, Ryan Jackson, and Javin Webb gives Herman three totally different weapons at running back. Greg Ward can make something out of nothing in the running game as well at quarterback. The offensive line loses three starters from a year ago, but could be stronger than last season. 4. The Houston secondary will have the most forced turnovers in the country. Good things are bound to happen when all four of your starters in the defensive backfield return for their senior campaign, especially when they are all top-level playmakers. Adrian McDonald, Lee Hightower, William Jackson, and Trevon Stewart had a combined 11 interceptions and 4 forced fumbles last season. Nickelback Brandon Wilson also forced a fumble, while backup defensive back Howard Wilson picked off three passes last year. This group is one of the deepest in the country and is ranked the 22nd-best defensive back unit in the country by Phil Steele. It wouldn’t be surprising to see the secondary’s turnover numbers drastically improve with the likes of Tennessee Tech, Texas State, and Vanderbilt on the non-conference schedule. 3. Greg Ward will pass for over 2,000 yards and rush for 1,000. How big of a playmaker is Ward? Good enough for me to believe that he can do very special things under Tom Herman’s and Major Applewhite’s offense. If you want to understand just how dangerous Ward is, look up his highlights last season on YouTube. The converted receiver has great football intangibles. He knows when to get out of the pocket. He has been pretty good at making plays when being flushed out by pressure. He is one of the better quarterbacks in the country at throwing on the run. Could you imagine how dangerous Ward could be if he makes a solid transition into Herman’s offense, as Braxton Miller did for Ohio State in 2012? It’s clear that if anything, Ward has the athletic ability to be just as potent a playmaker. 2. The Cougars will finish with more wins than any other Texas school. Is it likely? Probably not, but that doesn’t mean it’s not a very legitimate possibility. TCU is the favorite in the Big 12, but the Horned Frogs have to beat in-state rival Baylor at the end of the season, and they have SMU, Texas, and Texas Tech on the slate, which points to an accumulation of losses for those Lone Star State schools. TCU also faces tough road games against Oklahoma State and Oklahoma. Baylor starts the year without Bryce Petty and has to face Texas and TCU back to back to end the year — despite being conference title contenders. Houston would have to defeat Louisville and Vanderbilt in non-conference play and would have very little leeway in the AAC if it wants to finish with the best regular season record in the state. If TCU and Baylor both lose one game they shouldn’t, Houston could certainly rise to the top of Texas. 1. UH wins the AAC championship. Thanks to an improved coaching staff, the Cougars will be able to win most of their close contests and show that they have enough weapons on offense to overcome the foremost challenges that will come their way. Meanwhile, new defensive coordinator Todd Orlando will get the most out of a young defensive line and build up an already good linebacker and secondary corps. If it can all come together, Houston could make its way to the first AAC Championship Game.